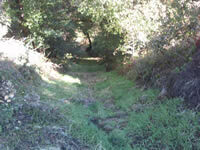 Many homes and locations in Santa Cruz County are accessible only along rural roadways that are often steep and unpaved. These are important corridors, but if not designed or maintained properly, rural roads can erode and degrade, causing traffic hazards, access issues, and sediment delivery into local streams and waterways. 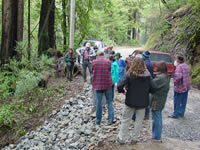 The RRECAP program provides private road associations, County Service Areas (CSA), and landowners with technical and cost share assistance to help implement erosion control and drainage management practices on rural roads in Santa Cruz County. The RCD helps identify erosion and drainage problems, develops erosion control plans, and providescost share assistance to help construct road improvement projects on both private and public roads. Some of the RCD’s recommended improvements include installing properly sized culverts, contouring the road surface, and applying rock to unpaved roads and culvert outlets to minimize erosion. 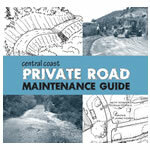 The RCD also holds technical trainings and road workshops for contractors and private residents. Culvert Replacements and Upgrades: A ditch relief culvert is used to convey water (often stormwater runoff) from one side of the road to the other. Culverts can be made out of corrugated metal pipe, corrugated plastic pipe, rigid plastic pipe, concrete pipe, or other suitable materials. Culverts that are improperly sized, installed, or maintained are subject to poor functioning or failure.Waterbars: A waterbar, also known as a water break, consists of a shallow trench with a parallel berm or ridge on the downslope side and is angled down across the road. They are often installed on infrequently used or closed roads to control surface runoff. Waterbars can be constructed by hand, with a backhoe, or with a blade-equipped tractor. They are usually made of compacted soil, but can also be asphalt or cement for longer life. Waterbars: A waterbar, also known as a water break, consists of a shallow trench with a parallel berm or ridge on the downslope side and is angled down across the road. 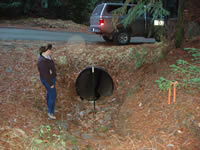 They are often installed on infrequently used or closed roads to control surface runoff. Waterbars can be constructed by hand, with a backhoe, or with a blade- equipped tractor. They are usually made of compacted soil, but can also be asphalt or cement for longer life. Road Shaping (Outsloping and insloping, rolling dips): Outsloped roads direct water off the road frequently thus reducing the buildup of fast moving water along the road surface. Because an outsloped road minimizes concentration of water and need for culverts, it can lower installation and maintenance costs. Insloped roads best control the road surface runoff, but concentrate water and thus require a system of ditches, cross-drains, and extra road width for the ditch. 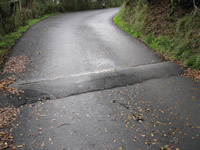 A rolling dip is a shallow, rounded dip in the road that reverses grade for a short distance, and directs water off the surface of the road to a controlled or protected outlet. 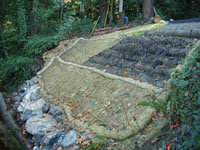 Rolling dips are installed as needed to drain the road surface and prevent erosion. 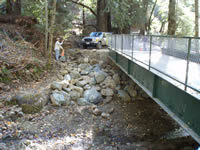 Stream Crossings: The construction of a stream crossing should be carefully considered. Any work impacting a stream will require permits, even if the streambank is bare of vegetation. Consult the RCD for guidance with the various permitting agencies (such as Santa Cruz County, California Department of Fish and Game and your Regional Water Quality Control Board). The RCD can save landowners significant time and money through its Permit Coordination Program. Bank Stabilizations: Bank stabilization is the process of establishing and implementing resistive measures against erosion and failure of roadway cut slopes or fill embankments. Stabilization may be achieved by either mechanical (structural) means, vegetative, or both. Permitting assistance is also available for these types of road improvements. Road Decommissioning: Decommissioning is done on roads that are no longer in use. A road may be decommissioned to eliminate environmental degradation, to reduce impacts associated with motorized access, or to avoid long-term road maintenance costs. 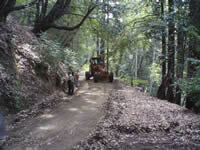 Because these roads will not be maintained, it is important to apply proper road shaping or other techniques to ensure that they will not create problems such as landslides or damage to downslope homes or creeks. Road decommissioning should not be confused with temporary road closure. Assistance with Road Association Formation: A road association is a voluntary organization of property owners that share road access. Road associations can be useful for providing overall road maintenance and improvement plans, ensuring access for emergency vehicles, sharing the costs of road maintenance and improvements, and developing a communications network for a localized community disaster plan. Road associations do not necessarily need the involvement of governmental associations to form and operate. The RCD can provide resources to individuals or groups interested in forming a road association. Federal, State or local funding may be available to assist landowners who are interested in completing roads projects.